The heating, ventilation, and air conditioning system is used to control the climate of a vehicles interior. It is referred to as the HVAC system and it is designed to allow a source of fresh air into the vehicle, as well as tailor interior temperature to suit the comfort needs of the occupants. The HVAC system also performs a vital safety roll by providing a means to clear ice, fog and moisture from the vehicle’s windshield and interior glass. Fresh air enters the vehicle through vents in the area of the base of the windshield. The air is drawn into HVAC module by the blower motor. The air is then routed to the heater core to be warmed or through the air conditioning evaporator to be cooled. It is then directed by air flow controls to the area requested by the operator. The air can be discharged to the windshield, in defroster mode, to the floor, in heater mode or through dash vents in A/C or vent position. Some vehicles offer a bi-level setting on the HVAC control panel which will cause air to be discharged from both the dash vents and the floor vents at the same time. Warming of the vehicles interior is accomplished by using the heat generated from the engine. 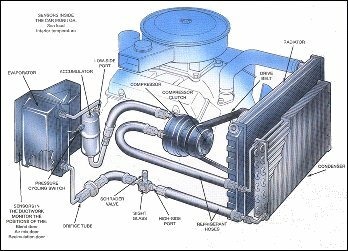 Hot coolant is circulated through a radiator like device called a heater core that is mounted in the HVAC module. Air is warmed when it is directed through the heater core by absorbing heat from the coolant. The air can be blended with cooler outside air to provide various temperature settings for the vehicles interior. A refrigeration system provides a means of cooling and de-humidifying the interior of a vehicle. Air is drawn through the evaporator and is both cooled and de-humidified by the removal of heat and moisture during the refrigeration process. Know as air conditioning, the refrigeration system operation is similar for all vehicles. Basic air conditioning operation uses the principals of latent heat to achieve cooling and de-humidification of air. Latent heat refers to the temperature properties when a substance is changed from one form to another. For example, the freezing point of water is 32F but 32F is also the melting point of water. When water is changing from liquid to solid form (water to ice), it must release some heat in order to make that transition. The heat released is absorbed by the surrounding air, causing the air to be warmed. When water changes from a solid to liquid (ice to water), it must remove heat from the air aid in the process. This causes that air to become cooler. It is the same process that allows a drink to be cooled by placing ice in a cup. Heat is removed from the surrounding liquid by the melting of the ice. Because water both freezes and melts at the same temperature, the heat that is removed or absorbed is a hidden component of the substance and referred to as latent heat. Latent heat principles are the base of operation for all air conditioning systems. Latent heat works in the refrigeration system through the changing of a substance known as refrigerant, from a vapor to a liquid and back to a vapor again. The cycle happens continually while the air conditioner is in operation. In order to make this happen, several components are used: the air conditioning compressor, condenser, control valves, receiver drier or accumulator, evaporator, and refrigerant (refer to a repair manual for the necessary diagnostic and repair procedures for the A/C system). A description of the operation of each of these components can be found in their respective sections. The understanding of their place in the function of the air conditioning system is needed to comprehend the basic operation of the air conditioner. The refrigerant exists in the air conditioning system in two forms, gas or liquid. The air conditioning compressor is used to change the gas form of the refrigerant from low pressure to high pressure. In changing the pressure of the gas, the compressor also causes the refrigerant to circulate through the system. The high pressure gas flows into the condenser where it changes from a high pressure gas to a high pressure liquid, releasing heat to the outside air in order to make the change. The high pressure liquid flows into a control valve where it is metered into an evaporator. The flow into the evaporator must be metered to prevent excess refrigerant from flooding the evaporator. As the high pressure liquid enters the evaporator, it changes to a low pressure gas, removing heat from the outside air to make the change. By removing heat, the moisture content of the air condenses on the outer surface of the evaporator, causing the air to be de-humidified and cooled where it is distributed to the interior of the vehicle. After leaving the evaporator the refrigerant is a low pressure gas. The refrigerant then flows into the compressor where it is changed to a high pressure gas and the cycle continues as previously described. The HVAC module contains the heater core, evaporator, and the air distribution controls. Air distribution is controlled through the use of vacuum, electric, or mechanically operated doors, that route air through the HVAC module as commanded by the operator. The position of the doors are determined through settings made by the operator to the control panel. 2 Comments on "Ac System Basics"
what is the vaccumm in microns for auto a/c?